We provide you the Tool Kit SW-1060, which has everything you need to get fixing that phone! Whether you’re a professional or just an amateur looking to work on phone repair on your own, this tool kit can be of great assistance. 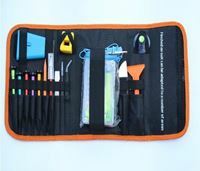 It has all the essentials you need, from screwdrivers to prizer, and is just the right kit for part repair and replacement for an iPhone 7. At CellPartsHub.com, you get this premium quality tool kit at the best pricing, and rest assured, you’ll be getting your money’s worth!